In contrast to the shocking black color, the ice cream usually is flavored mildly with vanilla or sesame. As it turns out, the blackness of the ice cream is not caused by artificial food dye additives, but rather by its eponym, activated charcoal. The most extreme of the health-conscious population herald the activated charcoal for its digestive health benefits; however, whether or not activated charcoal actually is beneficial when mixed with sugar and cream remains to be seen. Regardless, the real appeal of this ice cream is its novelty; it’s part punk rock with an avant-garde type of chic. Moreover, the search for black ice cream can take you all over the world. Check out any (or all) of the following seven spots, and you are guaranteed an experience that is very cool. Yes, pun intended. 2 Rivington St, New York, N.Y. Located in Manhattan’s quirky Lower East Side neighborhood, the Santorini blue storefront of Morgenstern’s invokes a vintage ice cream parlor and invites you in to sample from its vastly polarizing flavors. Offering both traditional ice cream flavors and those suited for a more nuanced palate, Morgenstern’s is no stranger to experimentation. While the inside features retro, minimalist black-and-white décor, there is minimal seating. Like most well-kept secrets in NYC, the black ice cream here has been featured in People Magazine and the New York Times, so get ready to wait in line for a while if you want a taste of their famed coconut ash ice cream. Demi Concept is the only food truck on the list, and it exudes a very hip, almost coffee shopesque vibe that would be more at home serving craft beers or nitro coffees than as an ice creamery. The truck is decorated with wooden paneling, low-key bulb lighting, and even the convenience of chairs while you wait in line. Nevertheless, they specialize in soft serve that comes in a variety of uniquely Asian flavors, such as Uji Matcha, Mango, Thai Tea and of course, Vanilla Charcoal, their resident black ice cream flavor. Your frozen treat can be served in a flavored cone to further compliment your ice cream experience, and it comes topped with Oreos and Gilco Bars to make it extra Instagram worthy (seriously, the Vanilla Charcoal swirled with anything looks really badass). It’s also extremely cheap, with prices ranging from 95-135 Thai Baht, which keeps you under $4 even if you go all-out. This highly rated ice cream shop in Montreal’s lively Notre-dame-de-grâce, or NDG, neighborhood features a coconut ash and black sesame rendition of the black ice cream trend that goes by the obvious name of “Jet Black Ice Cream”. Like a lot of ice creameries on this list, Ca Lem specializes in unusual flavors and soft serves, although you can get the Jet Black in both soft serve and regular form. This locale is also extremely welcoming, with service able to accommodate both French and English speakers. This ice cream parlor features a minimalist interior, but a colorful, watermelon green and red porch and outside seating area elevated with romantic string lights to round out the experience. Out of all of the black ice creams on this list, Glacier Vanille Noir’s has the most unique flavor profile, with ice cream that is more “salty” as opposed to the sweeter varieties that lean towards vanilla, or the more robust sesame ice creams on this list. The contemporary style black and yellow décor and logo of this eatery juxtaposes the old world architecture of the city of Marseilles. The sunny banners and outdoor seating welcomes you into the simple, unassuming interior, where the contrast of high and low continues. The interior of this shop is so unassuming and humble that you would hardly guess that this ice cream shop is actually home to gourmet ice creams that feature the highest quality ingredients. 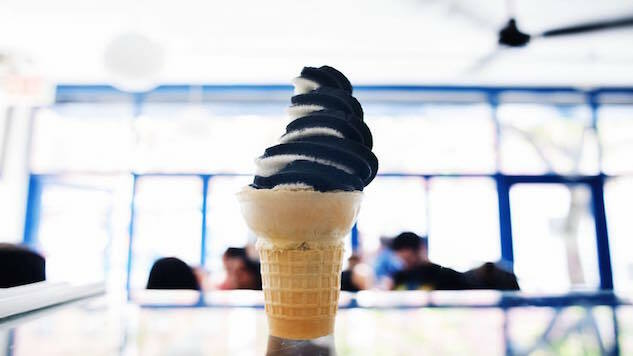 After experimenting with natural coloring agents such as cuttlefish ink and licorice, this ice creamery determined that charcoal created a satisfying black hue for their product. Tim & Tim takes its ice cream seriously, and has sought to create a black ice cream as delicately balanced and nuanced as a luxury perfume. Tasters can expect layered notes of flavors such as cinnamon, vanilla, spices, and even orange blossom coming over the top. The vibrant black of the ice cream provides a shocking juxtaposition to its delicate and soft flavor notes. For a healthier option than your standard ice cream, turn to BLK 513, which actually serves a black frozen Greek yogurt rather than ice cream. If you need another reason to indulge in this sweet treat, this company touts the health benefit of consuming charcoal. They claim that charcoal helps the body cleanse itself of toxins. Unlike at the standard American frozen yogurt spot, one does not dispense their own yogurt into a cup and then pile on toppings afterwards. Rather, the good people at BLK 513 carefully craft the desserts into a parfait-like structure and add toppings and frozen yogurt in layers to create a more balanced experience. An important thing to note with this place is that you cannot order the yogurt by itself; they make you order the entire sundae, so if you are not into toppings, skip this one. 136-37 Roosevelt Ave, Queens, N.Y. Specializing in taiyaki style ice cream, Ice & Pan sets itself and its desserts apart for inherent uniqueness. Located in Queens’ Flushing neighborhood, this locale features Asian-inspired red, modern décor with cute anime decorations on the walls, adding to its authenticity. Their primary focus centers around their own special take on taiyaki, a Japanese dessert that consists of a small cake shaped like a fish and filled with a warm filling of your choice. They add an Ice & Pan-style flair to it by completing the dessert by topping it with mochi, strawberries or marshmallows and soft-serve ice cream, one of which flavors is charcoal sesame ice cream. However, unlike the other ice creams on this list, this one is not a true black, but more of a dark gray. Don’t worry; it still has plenty of punk-rock appeal. A word to the wise for those sampling this sweet: because the taiyaki is custom-made and served warm, not only should you anticipate a small wait, but also come prepared to eat it with haste as the warm taiyaki quickly melts the ice cream on top.